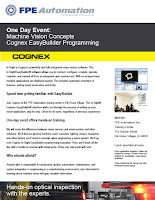 Join Cognex and FPE Automation for a one-day event. In-Sight is Cognex’s powerfully and fully integrated vision sensor software. The In-Sight/EasyBuilder® software allows you to connect, configure, emulate, operate, maintain, and expand all from an integrated user environment. With no programming needed, applications are deployed quickly. This includes automatic extraction of features, setting smart parameters and limits. There is no charge for FPE Automation customers to attend this event.